If you’ve ever wondered what your cat means when they meow at you, read this article for a guide on translating your cat’s meows! Day after day, we hear our cats make all sorts of sounds ranging from soft purrs to hisses. Even though we can’t translate cat speak, we can understand what our cats are trying to tell us by listening to the types of sounds they make. In this month’s article, we explain the eleven most common cat sounds – and what it means when your cat makes them! Short meows - these are the most common and they’re usually just as a result of your cat wanting to say hello! This is nothing to worry about at all - your cat probably just wants some attention! Multiple meows - if your cat constantly meows, that’s a sign they’re very excited and happy. Just like the short meows, there’s no reason to worry. Mid-pitch meows - a mid-pitch meow usually means your cat is asking for something. It could just be playtime or attention so if your cat starts to meow this way around dinner time, they’re probably just hungry! 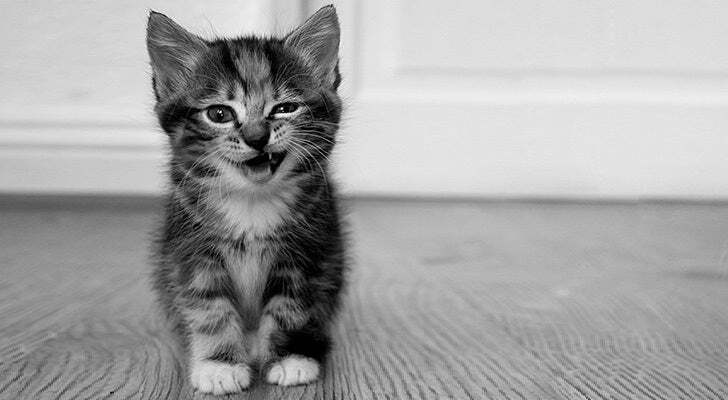 Low-pitch meows - a low-pitch meow just means that your cat is complaining or unhappy about something. If your cat is in a bad mood they’ll make it very clear! High-pitch meows - cats meow in a high-pitch when they’re in pain. It might be physical pain from accidentally injuring themselves so high-pitch meows are a good way to recognise if your cat is hurt from a fight too! Long meows - just like with the mid-pitch meows, your cat wants something. If your cat is meowing like this however, it’s usually just a demand! Growl - cats usually growl when they’re angry (especially when they fight with other cats to protect their territory). If your cat is growling, it could be smart to give them space to avoid scratches or bites! Howl - a howling cat probably feels in danger or needs immediate help because of an injury or sickness. If your cat is persistently howling, a vet visit may be necessary. Hissing - cats can also hiss when they’re angry or upset but also if they’re surrounding by unfamiliar people, environments or unwanted doggy friends! Caterwaul - caterwauls are low, moaning sounds that female cats make in heat to alert other cats. Purring - finally, the most content sound a cat can make is purring. Humans smile, dogs wag their tail and cats purr! When a cat purrs, you know they feel comfortable and happy in your presence. It is worth noting however, that a sick or injured cat may purr to comfort themselves (a little like thumb sucking in a baby) if they are sick or injured - but you will usually have other indications of that also. So in almost all cases, purring is a good thing! If you need to control excessive, non pain related meowing, there are a few things you could consider like making sure your cat has access to all of their favourite toys and a comfortable environment or giving your cat treats or food a few times a day (they could just be hungry!) or just keeping your cat company and playing with them! If your cat looks uncomfortable and in pain however, the meowing could be a result of a health issue so pop into your local vet for a consult. Hopefully, armed with this knowledge of why cats meow, you’ll be able to better tend to your beloved cat’s needs / demands!